This movie, my friends, is why I have to remind myself NOT to judge anything by its cover. I loved it. Every shot, every second, every line. As a not-so-subtle tribute to everything camp slasher (literal summer camp slasher), and a clear nod to the Friday the 13th series, it was perfect. Do yourself a favor this week, and if not now, then definitely on this Friday the 13th…watch some F13…and then pop in The Final Girls. You will love it. On another note, best striptease scene ever. EVER. Yes, my friends, even Dusk Till Dawn. Back in the 90s, I was wild for books. I still am, but the point here is that I devoured every book fair that came to school. Especially when it came to book lights and horror stories. Monster Road was one of my favorites. Perhaps it was the cover that drew me to it, or the fact that I’d run out of Goosebumps books, but this one was pretty easy to miss tucked back at the bottom ‘L’ shelf. Written by David Lubar, Monster Road tells the story of Kevin taking a road trip with his eccentric scientist Uncle. Eccentric and wildly naive, every single monster Kevin’s uncle meets on the trip strikes him as something absolutely mundane and non-supernatural in any way. What’s more, he seems to come up with a solution for most of their problems in the process. My old copy I had of Monster Road sadly fell to pieces, but that’s the sign of a well-loved book. At least for a kid. 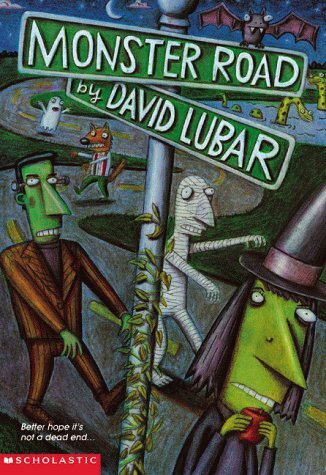 Monster Road is a great little story to read with your kid, or to just let them read on their own, lying in the somewhat sketchy area of 2nd grade – 4th grade reading level. When this movie first came out in ’06, I saw plenty of people talking about it all over the net. 2 years after Shaun of the Dead, it seemed like there was finally going to be a new renaissance of horror comedy. There really wasn’t much of one, but that is an entirely different topic for another day. Fido kind of fell to the wayside after a bit, though, in the shadow of Shaun. But you want to know something? It shouldn’t have. It’s really a great little film, worth it’s own merit. The only thing it shares in common with the more famous zombie comedy is the fact that it IS a zombie comedy, and they run with the idea of having the creatures as pets after we’ve managed to ‘tame them’. Imagine if the 50s wasn’t about the fear of communism or nuclear war, but zombies. You pretty much have Fido, but there’s really more to it. The main character, Fido, has more behind the facade of a drooling and brain-crazy slave to his nuclear family. Billy Connolly is…incredible in this. I honestly didn’t even realize he was Billy Connolly at first, without the eccentric beard and long hair. Everyone is really amazing in this movie. 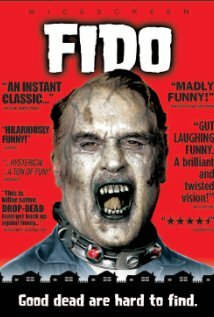 I can’t express enough how great Fido is, as a horror comedy fan. If you take your horror too seriously, avoid it. IF you have a sense of humor, I’d definitely suggest ‘Fido’ for a Halloween viewing this year. 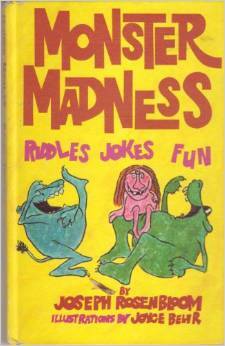 Because, as I’m sure you’re all aware, I am a highly intellectual being…I decided the perfect book to feature this week just in time for the approaching Halloween season had to be ‘Monster Madness’, a grizzly grimoire of garish gags. Alliteration aside, it’s a collection of cute (and often very cheesy) monster jokes, riddles, and tongue twisters. As a theatre graduate, the tongue twisters were easily mastered, but I still can’t withhold the immense groans most of these gems produce, jokes such as ‘What steps do you take when you’re chased by a giant? Giant Steps.’ Not to mention, ‘What do ghouls wear on their feet in the rain? Ghoul-ashes!’…and that’s why I think this is the perfect little collection to feature this week for children and parents alike. If you can’t drive the trick-or-treaters away with the promise of treats…you might as well trick them into listening to these.